Larco Engineering supply & repair cold storage doors. Contact us today for a quote. In an environment where it is important to satisfy stringent temperature control, yet maintain high levels of through traffic, it is necessary to use the correct cold storage doors. That’s why here at Larco Engineering we offer a wide range of cold storage doors to suit your needs. Larco Engineering install & repair robustly constructed cold storage doors that can be positioned differently according to our clients requirements. Our cold storage doors are tough, well-insulated doors that can withstand a great deal of wear without losing their hygienic properties. 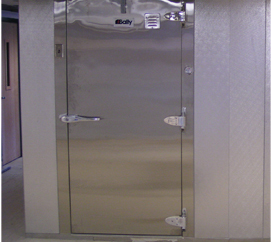 Larco Engineering’s doors are perfect for cold rooms, cold stores and freezers. We supply cold storage doors to commercial & industrial premises throughout Ireland. If you have a specific application or requirement, contact us and we will recommend the best and most competitively priced solution for your temperature controlled cold storage door needs. At Larco Engineering we pride ourselves on our work and that is why we offer an extensive warranty on all the cold storage doors we fit and all the cold storage industrial doors we repair. Our repair team operate throughout Munster & Leinster where we have a large number of satisfied customers.